The 2017–18 Live in HD season concluded with an enchanted performance of Cendrillon, Massenet’s glittering operatic adaptation of the Cinderella story. This charming staging by Laurent Pelly, which bursts to life with the director’s characteristic wit and whimsy, stars American mezzo-soprano Joyce DiDonato as the title outcast-turned-princess. Mezzo-soprano Alice Coote offers a touching portrayal of the pants role Prince Charming, while soprano Kathleen Kim shines as the Fairy Godmother. 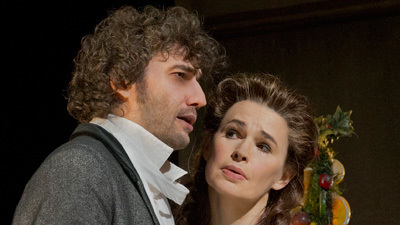 Mezzo-soprano Stephanie Blythe, as the outlandish Madame de la Haltière, and bass-baritone Laurent Naouri, as the haggard Pandolfe, round out the principal cast. On the podium, conductor Bertrand de Billy leads a performance that is equal parts madcap comedy and heartfelt romance.